A little disclaimer... these DIY Series posts are intended to give you a general idea of how to build simple structures and/or complete easy weekend projects around the house. This is not a step by step instruction manual as everyone's situation is different. If you have any questions or comments regarding our series please feel free to post a comment and we will do our best to answer your question! Let's stick with our outdoor theme for a bit. 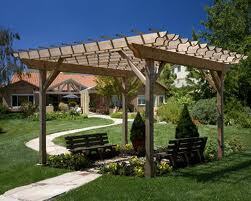 Here in Part 2 we will focus on pergolas; not to be confused with trellises... What is the difference? Trellises are generally free-standing structures made out of wood or metal with crossbars. They can be attached to a wall (see part one). Pergolas are also structures with crossbars but they are supported by pillars and can be used to cover a seating area, patio, or a walkway. Pergolas also add a more luxurious appeal to an outdoor area. While you would probably want to build and install your trellis in your front yard (i.e., over an entry or at your garage door) your pergola will most likely spice up your backyard! This is a relatively easy structure to build over a weekend. The materials and details are really up to you. Get creative with it. There are tons of HOW TO guides all over the internet but you should always try to make your projects your own. As far as the size, color, and detail of your pergola? This should all be up to you. 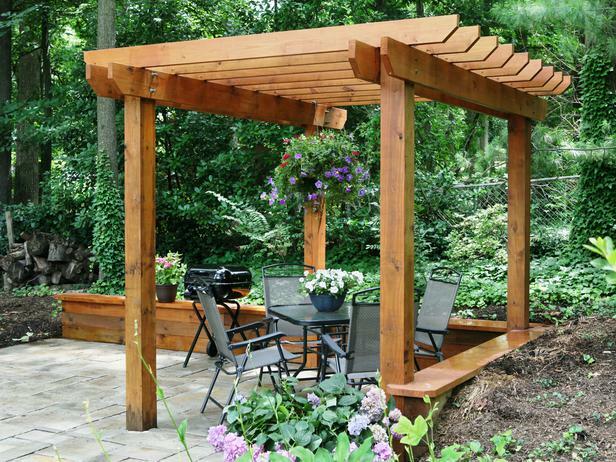 Just remember, the larger or longer your pergola, the more support posts you will need. For arguments sake, let's consider installing a 10' x 10' pergola. Note: If you are going to be installing your pergola in grass you will have to set your posts in concrete. A good rule of thumb would be to dig down 36" and a diameter 3 to 4 times the size of the post; however, you should check with your local municipality to make sure you are adhering to their guidelines and code. Assuming you will be installing your pergola on an existing concrete patio you will need to start with post anchors. 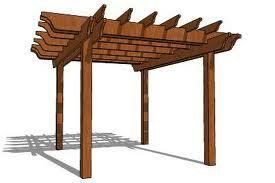 For a 10' x 10' pergola you will need 4 4"x4"x10' posts. The type of wood you choose should be dependent on your local weather patterns. 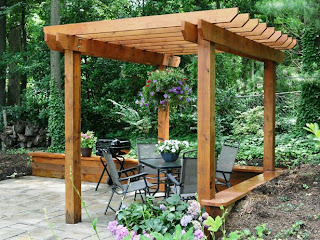 Cedar is a good choice because it weathers well; however, some people choose pressure treated wood and then paint the pergola. Your post anchors come in different sizes so make sure you choose the correct anchor for your post size. 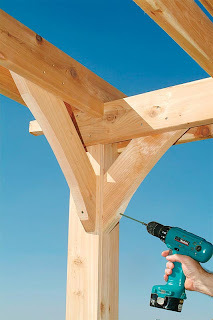 You will use Tapcons to connect your post anchor to the concrete and wood nails to nail the anchor to your actual post. 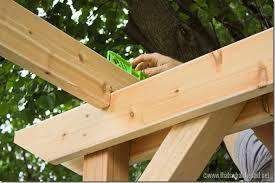 Use a level to ensure that your posts are being installed straight. Finally you will add the crossbeams. Measure the cross beams (again using 2" x 6" boards) and mark the area where you will need to notch the cross beams in order to bracket into your support beams. 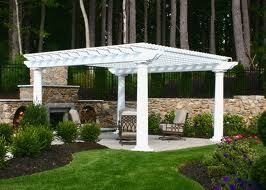 With a 10' x 10' pergola you should have between 6 and 8 cross beams. Again, this is a matter of personal preference so add as many you would like. Notch your cross beams with a table saw (as mentioned in part 1, if you do not have tools, you can have the hardware store pre-cut all of your lumber). 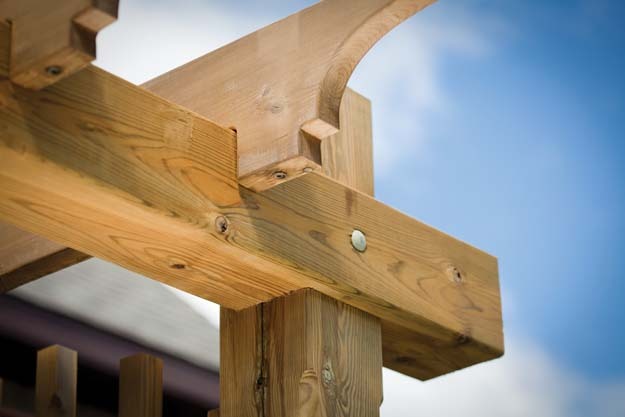 Attach your cross beams to your support beams and use a wood screw (long enough to successfully reach and adhere to support beam) to attach both beams. Again, edge detail for your cross beam is up to you. Add a diagonal brace at each post and connect to to the support beams for additional reinforcement. So there you have it! Another easy weekend project that will not only give you something to do but also increase your home's backyard appeal!